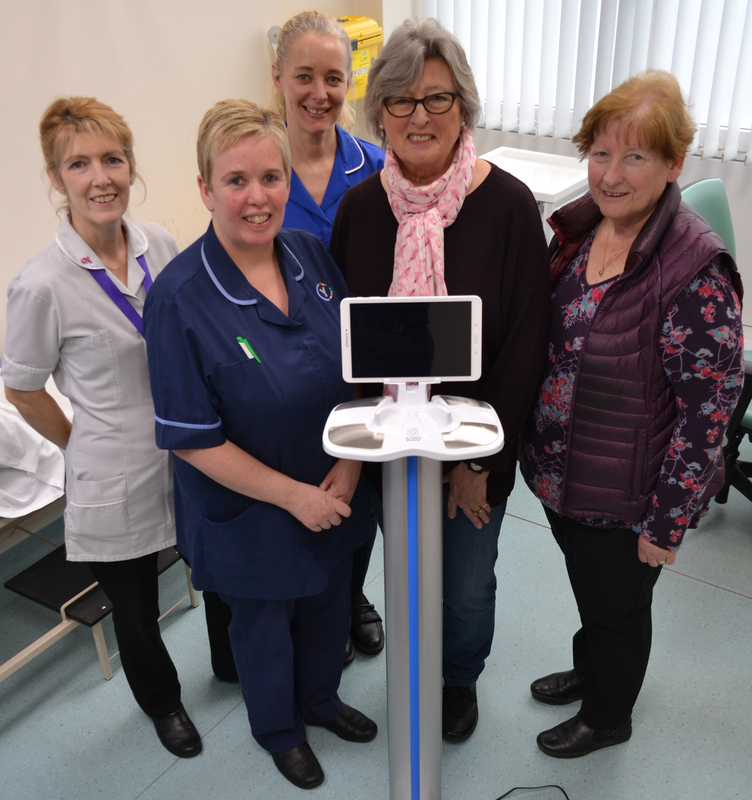 Patients at Yeovil Hospital are benefitting from a new state-of-the-art device to detect lymphedema, thanks to the generosity of the Hospital’s League of Friends. Lymphedema is a common and painful condition often associated with cancer, or cancer treatment which most commonly affects the arms and legs. It develops when the lymphatic system – a network of channels and glands throughout the body that helps fight infection and remove excess fluid – doesn’t work properly and fluid collects in the body’s tissue, causing serious swelling. Detecting and treating the condition quickly is vital to successful treatment; left untreated it can become more severe and persistent. Yeovil Hospital’s new Sozo machine uses bioimpedance to measure the amount of fluid around cells in the body. It takes just seconds for the machine to carry out the test, which is comfortable and completely non-invasive. Results are immediately available digitally to the clinical staff so they can either put the patient’s mind at rest, or swiftly arrange specialist treatment to manage the condition before it worsens and potentially becomes chronic. The machine was funded by the Hospital’s League of Friends and is now used routinely by the breast care team to test their patients, before any physical signs of lymphedema are present. Previously, the team had to rely on simply measuring a patient’s arms with a tape-measure to detect any unusual changes. “This is a major improvement to the care we provide our patients. The accuracy and speed of the test carried out by the Sozo machine enables us to detect and start treatment for lymphedema much earlier than before. That means less worry for patients already undergoing treatment for cancer, and less risk of the condition becoming chronic. Members of the Friends recently got to see the machine in action at the hospital, where Chairman Anne Bennett was impressed by its speed and simplicity. “This is precisely the kind of thing the Friends are here to provide,” she said. “It’s something which enables our hospital to provide a swifter, better service to patients and helps to keep us at the cutting edge of health care.